“Cost of sales is determined by a lot of things,” Jake said, “But lead management isn’t one of them.” And with that the sales manager slapped the table with his hand to emphasize his words. “So prove it,” he said with a slight smirk that could have meant almost anything. And that started a 15 minute discussion, yes, only 15 minutes and he became a believer. 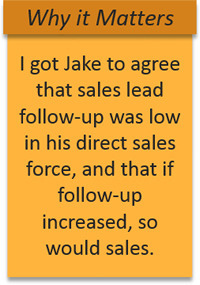 First, I got Jake to agree that sales lead follow-up was low in his direct sales force, and that if follow-up increased, so would the closing ratio. Follow-up is the responsibility of the sales reps and as reported in the CRM system it was only 15%. If we allowed that some follow-up occurred without closing the leads out in the CRM system, we can expect that 25-30% real follow-up is generous; but this is only a third of what was required. Who succeeds by only doing a third of what is required? Jake also agreed that the source of leads would be graded as successes or failures based on the sales representatives’ reports. The failure to produce leads that turned into sales would eventually lead marketing to spend more money on things that worked and stop spending money on failures. Of course, some money he admitted is always spent on some branding (like that yearly golf outing he liked so much). Jake also admitted that by asking for a report on follow-up, the real follow-up of inquiries and leads would surge. By taking Jake in a circle we showed that inquiries will be graded and qualified by marketing and then given to sales reps. The rep follow-up, judgment and recording of completed actions in the CRM record will prompt marketing to do its job of finding the most qualified prospects. Sales lead follow-up will yield greater sales. Increased sales leads to increased quota attainment. Quota attainment leads to better territory management and a lower turn-over in the sales ranks. Reporting on lead-closure or failure leads to an increase in qualified leads. Yes, there are in-between steps for nurturing, but essentially the work of sorting the lambs from the goats can only come from management and salespeople. Jake reluctantly admitted that with better sales lead management he could reduce the cost of sales while increasing revenue. As I left he said, “Just give us better leads and we’ll do the rest.” I liked the sound of that because now Jake understood the rest of the story.